Lobsang Jamyang (pen-name Lomik), 28, was arbitrarily detained on 17 April 2015, in Ngaba county, Amdo (now incorporated into China’s Sichuan province). 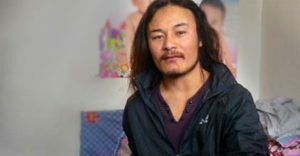 After he was taken into police custody, 20 Tibetan writers wrote a joint article stating they believed Lomik’s essays on the lack of freedom of expression and the 2008 Tibetan Uprising were the reason for his detention. Until his trial, Lomik was held incommunicado with no information provided on his whereabouts or the charges being brought against him. Lomik is understood to have been subjected to beatings, torture and interrogations whilst being held in detention. The trial was held behind closed doors in Lunggu county, Ngaba prefecture on an unknown date. Given the secretive nature of the judicial procedure – Lomik’s family were not informed of the trial or sentencing – it is likely Lomik did not receive due process. On 9 May, Lomik’s family were granted permission by the authorities to see him. They were only allowed 30 minutes, during which time they learned of his sentence and the charges brought against him: “leaking state secrets” and “engaging in separatist activities” over the period of 2009 to 2015. Lomik said he refused to accept the charges. In 2010, he wrote a book called The Yellow Fog. He also organised public debates, including one entitled Denial of Free Expression, and contributed to popular Tibetan language websites. The titles of some of his articles include Story Shackled By Iron Chains, Weapons Target Writers of Ngaba and Until I Die, I Will Express My Views. Lomik is the second Tibetan writer to be imprisoned this year, after Shokjang was given a three-year sentence in February. Lomik and Shokjang had participated together in a number of panel discussions at the Qinghai Nationalities University, a minority nationalities’ university in Xining. Since the Tibetan uprising of 2008, the Chinese government has sought to eradicate all forms of dissent. This has included peaceful expressions of nationalism in the form of essays, poetry and songs, displays of Tibetan culture and even non-state sanctioned teaching of the Tibetan language.